The newest Fromm battery strapping tool, the P331 is the best banding tool currently on the market. The P331 pulls up to 1,600 pounds of tension on either 3/4" or 1.25" polyester banding. The Fromm P331 looks similar to the P330 tool but has a higher tension ability, and now includes 1 1/4" poly strapping. 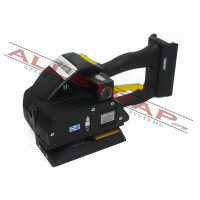 Not many battery tools for polyester banding offer the 1 1/4" option. The sealing lever has been removed on the P331 model, now it has two buttons that give the choice to run in auto mode. This is a durable tool with reliable applications, every time. This tool is a great addition to any shipping floor. This bander is the Signode BXT2-32 only competitor. With all of the issues surfacing from the BXT2-32 tool, we assume this tool will soon overtake the HD poly strapping sector. Allstrap heavily prefers the P331 over the BXT2-32, due to its performance and durability. The Fromm P331 is now available with two 5 amp hour lithium batteries (exclusively available from Allstrap), and a charger. Need your Fromm P331 repaired? Send it to our Tool Repair Department for a quick turnaround. > Strap size: 3/4" to 1 1/4" X .016"- .053"
> Max Tension: Adjustable up to 1,600 lbs. Fromm's P331 battery combination tension and weld too is the best we have ever seen for plastic strapping! Sure, it is a bit heavy, but compared to other tools it basically holds up forever. It is also much lighter than the steel strapping tools! The P331 is the safest tool to use on HD PET strapping, thanks to the brains in the tool that guarantee the weld sets. This is the only battery powered strapping tool that locks the weld down, effectively eliminating the risk of an operator pulling the tool open before the weld sets. The lock down is a really really big deal! Fromm P331 Battery Strapping Tool for Plastic StrappingThe newest Fromm battery strapping tool, the ..